Star Trek postage stamps are being unveiled at secret locations across the country between now and throughout May. Each spot will have a Canadian connection to the science-fiction franchise and fans in Ottawa – likely bursting with excitement that’s akin to a warp core breach – have a lot to look forward to. Boldly going where no Canadian postage has gone before, new self-adhesive stamps inspired by Star Trek’s 50th anniversary will soon grace paper envelopes from coast-to-coast. 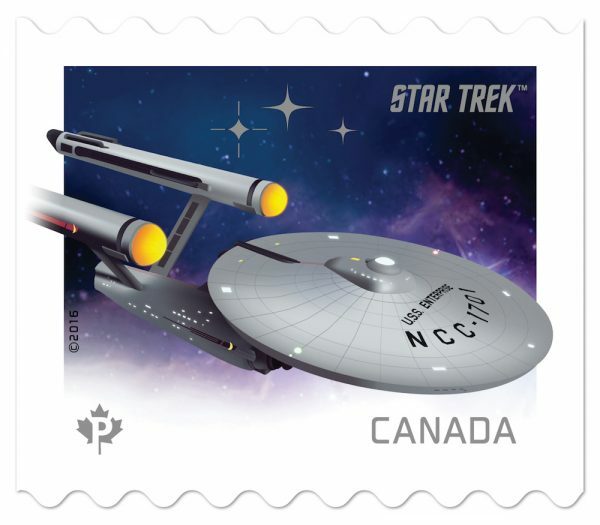 “We’re doing the [Star Trek] launch series a bit different than usual,” says Phil Legault, a spokesperson for Canada Post who explains that the stamps are being unveiled at secret locations in order to highlight connections between Star Trek and Canada. The first two stamps include images of Captain James T. Kirk (featured above) and the Starship Enterprise (below). Both were recently revealed in Montreal because it’s the birthplace of William Shatner, who starred as Captain Kirk in the original television series that debuted on September 8,1966. A third stamp, featuring Spock, appeared about two weeks ago in the rural town of Vulcan, Alberta. “They did a great job and it looks really super,” he continues, noting that a large replica of the stamp is now on display with other Star Trek memorabilia in their official tourism office that is shaped like a space station. Grant explains how the town of Vulcan, named after the Greek god of fire, got its name because of its red clay and terrain, long before Star Trek first aired. Combined with an official license to sell Star Trek merchandise, the town attracts fans and celebrities including the late Leonard Nimoy, who starred as the original Spock. “We gave him a key to the community…and we welcomed him home, back to Vulcan,” says Grant, recalling the 2010 visit. Back in Ottawa, Chris Green is a long-time stamp collector who owns a stamp shop in the Glebe. 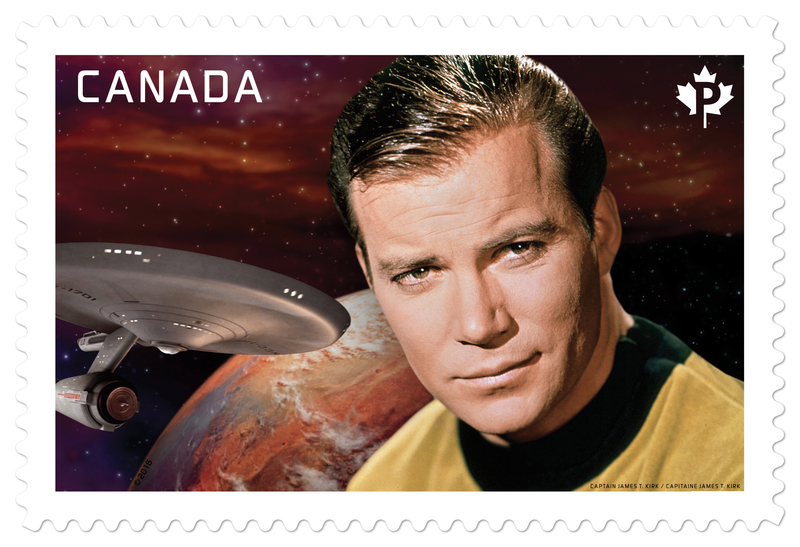 “Star Trek was probably my favorite show when I was growing up,” he says, noting that this is the first time Star Trek has appeared on a Canadian stamp. While the days of licking stamps are pretty much gone, Green says that stamp collecting isn’t fading away and will likely continue to live long, and prosper. “It’s a growing hobby, especially in Asia and China,” he says, pointing out that Ottawa has three active stamp clubs and hosts Orapex, one of the largest annual stamp shows in Canada [April 30-May 1]. For potential collectors who may be channeling their inner-Ferengi, Green stops short of suggesting that the new stamps will be a lucrative venture. “I never council people to buy stamps as an investment,” he says. Star Trek has left its mark on Canada in ways that extend well beyond postage. For example, numerous Spock-ified blue portraits of Canada’s seventh prime minister, Sir Wilfrid Laurier, are floating about on five-dollar bills. The phenomenon, known as ‘Spocking Fives,’ surged following Nimoy’s death in 2015. As a result, The Bank of Canada has stepped forward to say that while defacing Canadian currency is not technically illegal — there are reasons for why the practice is illogical. Canada Post won’t give up any more details on the forthcoming stamps and in the absence of a Vulcan mind meld or a Betazoid, Apt613 predicts that Vancouver might be next because it’s the birthplace of James Doohan [aka “Scotty” in the original TV series]. In the meantime, Star Trek fans have plenty to look forward to over the coming months in Ottawa. At least two actors from the Star Trek franchise will attendOttawa Commiccon from May 13-15 including John de Lancie [aka The Omnipotent Q] and René Auberjonois [Odo in Star Trek: Deep Space Nine]. The world debut of Star Trek: The Starfleet Academy Experience, an interactive exhibit, also opens at the Canadian Aviation and Space Museum in mid-May. And for those who can’t get their hands on out-of-stock Vulcan Ale from Nova Scotia, there’s a new Star Trek-inspired beer from Clocktower Brew Pub in Ottawa called The Final Frontier. This article was published Apr 20, 2016, via Apt613.